This lightweight lift safely and securely transports a micro or travel power chair and is compatible with Class I or larger trailer hitches. Weighing only 70 pounds with a 135 pound lifting capacity, the AL050 Micro Lift offers a simple, economical solution for transporting today's smaller power chairs. Q: Is this lift compatible with my vehicle? A: Harmar Mobility's knowledgeable authorized dealers will be glad to discuss your needs and recommend the proper lift for your application. Q: Is my lift weather resistant? A: Yes. The lift is designed to be fully weather resistant and designed to withstand outdoor use. The remote hand controls available with some models, however, are not weather resistant and must be removed and stored inside the vehicle. Q: Can one lift be moved between two different vehicles? A: While it is possible to move a lift from one vehicle to another, it is not recommended to do so frequently. If two different vehicles will be used often, we recommend having a lift installed on each vehicle. A: All Harmar Mobility products are designed and tested to operate flawlessly for years of trouble-free use with very little maintenance. Please refer to the Owners' Manual for specific product maintenance schedules. Q: Can the lift be plugged into the existing wiring on my vehicle? Q: The lift is powered by my vehicle's battery; what if my car looses power? Q: How does the lift connect to my vehicle? A: The lift will be installed onto your vehicle via the vehicle's hitch. A hitch is a device that is permanently attached to a vehicle to provide for towing or carrying capabilities. Harmar Mobility does not supply hitches; they can be purchased and installed through a local hitch dealer. Q: How much weight can a vehicle carry? A: All trailer hitches are divided into distinct classes and are rated to a specific weight carrying and a weight towing capacity. The COMBINED weight of the lift and power chair or scooter must fall under the weight carrying capacity for the hitch and the vehicle. 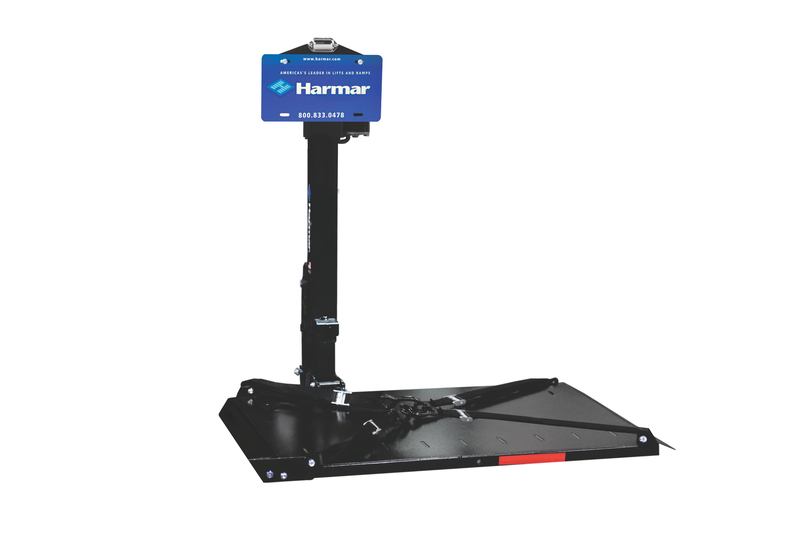 Your Harmar Mobility Authorized Dealer can assist you in determining the correct weight for your particular application. Q: My vehicle has a rear hatch or tailgate; will is still be accessible? A: Harmar Mobility recommends the addition of the Swing Away Option, which allows you to easily pivot an unloaded, folded lift away from the vehicle for clear access to tail and lift gates. Q: Does the vehicle's suspension need to be strengthened? A: If the vehicle will accept a Class III trailer hitch, you generally will not need to supplement the suspension. If the vehicle has, or will only accept, a Class II trailer hitch, call a Harmar Mobility Authorized Dealer or a hitch manufacturer for guidance. A: In the folded position, Harmar's Outside Lift Systems extend approximately 12 inches behind the vehicle bumper. The Swing Away option will add approximately two more inches. 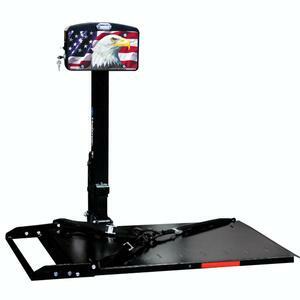 A: The standard lift is adjustable to a maximum trailer hitch height of 19 inches. Additional reach is available through an extensive selection of hitch adapter accessories, which can be purchased through your authorized Harmar Mobility dealer. Q: Is a swing Away required for an outside lift? A: Swing Away is an optional accessory that can be added to all outside lifts. It allows you to easily swing an UNLOADED lift away from the vehicle in order to gain full access to rear cargo areas. In vehicles equipped with lift gates or tailgates a swing away would be required in order to access these rear storage areas. Q: I already own my lift; can the Swing Away option be added? A: Yes, a Swing Away may be added at any time. A: NO. The Swing Away may only be opened when the lift is unloaded and folded position.